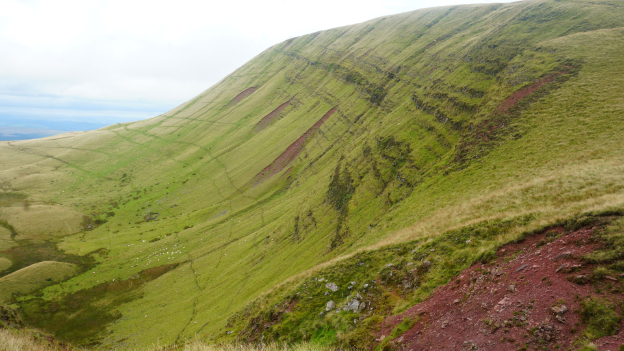 The Cambrian Way is a 290 mile coast-to-coast walk through the wildest heights and depths of Wales. In August 2017 I walked South-to-North from Cardiff to Conwy. The original route was devised by Tony Drake of the Ramblers Association. He sold his family business to dedicate his life to walking the outdoors. Much of his work helped established many rights of way across Britain. Since his death, The Cambrian Way Trust maintains the website posthumously and promotes the trail. Even so, the trail remains unofficial and it is not widely known. The trail is a high-level mountain route with an ascent of around 24,000 metres – not for the faint hearted – the total elevation is around three times the height of Mount Everest. I anticipated this walk would take me 18-20 days, based on my daily rate for Cape Wrath Trail in March, but due to good conditions and fitness I shaved it down to 15 days.